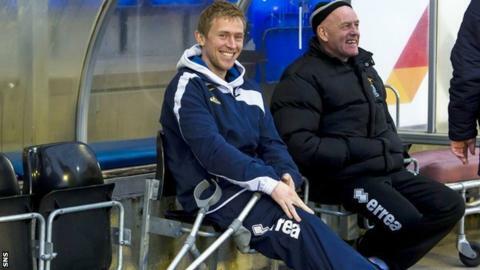 Inverness Caledonian Thistle captain Richie Foran has undergone a minor knee operation, manager John Hughes has confirmed to BBC Scotland. The Irishman is serving a one-match suspension and would have been unavailable for Friday's Highland derby against Ross County. Foran attended the midweek defeat by Motherwell on crutches. "Richie's injured," said Hughes. "He's going to get a wee operation today to get his knee cleaned out a little bit."